I have written two functions, one actual and one helper, to convert camelCase strings into snake_case strings (I call it joint-lower case). Any ideas for improvement are welcome. """Camel case to joint-lower helper.""" """Converts a camel case string to joint-lower.""" I think regex would be the easiest to do this with. You just need to find each word in the string. The name starts with an uppercase letter. [A-Z]. However due to the way the rest of the regex works, we can change this to ., so that we match all words, even ones that start with _. The word will either contain uppercase or lowercase letters, both with other characters - excluding _. Now that we established (1), you can get rid of the yields. yield is useful when you want to process stuff in chunks and do not want to wait for the entire population to be created first. This is not the case here. There are some continues that do make sense and some that are redundant. Yours are of the latter type. Nested if statements without corresponding else clauses can be merged with and if readability is not reduced. Finally, some thoughts on avoiding the try block that bothers me personally. Note the i != len(my_str)-1 on the left side of the and. If this returns False the my_str[i+1] is not evaluated at all and thus cannot raise the IndexError. First a note on naming: cc2jl is a very cryptic name. Give the public function a clearer name, like to_snake_case or something similar (note that the function does not do anything to a string that already is in snake_case). This is definitely shorter, even though that cryptic regex is not very easy to understand. But following your code, while written quite straightforward, is also not easy, especially with the deep nesting. It works by first splitting runs of upper-case letters followed by one or more lowercase letters so that the last upper-case letter goes to the lower-case letter run. So "ABCdef" becomes "AB_Cdef". Then it separates runs of not-upper-case letters, followed by a single upper-case letter with a "_", so "abcD" becomes "abc_D". 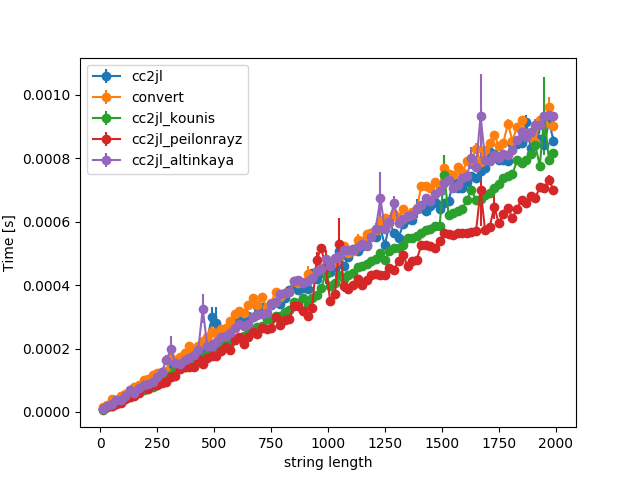 Not quite surprising, they all give a linear behavior (as a function of string length). My regex version needs to make two passes over the string and is therefore consistently slower. The function written by @Ev.Kounis in his answer outperforms both of ours, but the regex approach by @Peilonrayz is even faster, because it manages to do only one pass, but with a regex. Note that all functions are very fast, so as long as you need this less than a few thousand times per second, any is fine. Not the answer you're looking for? Browse other questions tagged python strings python-3.x or ask your own question.